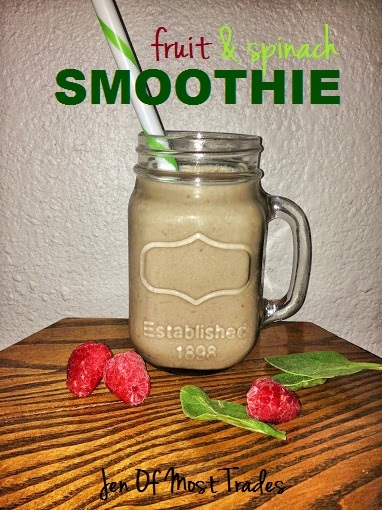 This smoothie is so yummy and made with ingredients that are good for you. I’ve been making this smoothie for many years, and even though I don’t measure, it always comes out tasty! I will put approximate measurements as a guideline to follow. Put all ingredients into your blender and blend until smooth. Add milk until you reach your desired consistency. This recipe serves one, but you could easily double it depending on your blender size. Enjoy!! Welcome to my blog! I'm Jen. This blog is about simplifying, organizing, beautifying, cooking, and everything in between. I would love to hear your comments and try to answer your questions. Thanks for stopping by. Be sure to "follow" this blog so you don't miss out on any of its goodness!!! I love this blog! Check it out.